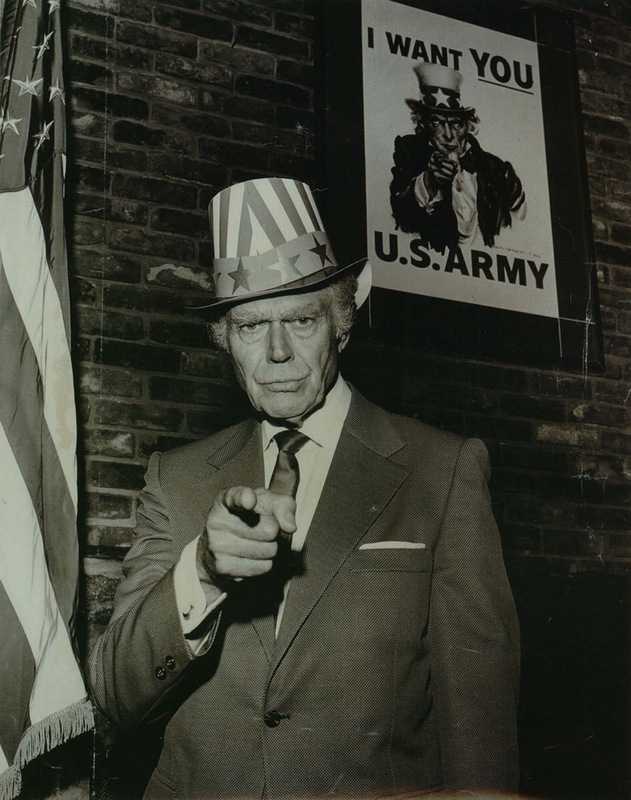 Walter Botts posing as Uncle Sam at opening of Uncle Sam’s Newsroom Restaurant and Lodge, 1970. The term Uncle Sam is reputedly derived from Samuel Wilson, a meat packer from Troy, New York, who supplied rations for the soldiers during the War of 1812. There was a requirement at the time for contractors to stamp their name and where the rations came from onto the food they were sending. Wilson’s packages were labeled “E.A – US”. Although intended to stand for “United States”, this caused some consternation because the more typical abbreviation at the time was “U. States”. Samuel was widely known by friends and business acquaintances as “Uncle Sam” for his genial character and sense of humor. Taking their cue from his reputation and the “U.S.” he stamped on meat casks, army troops began joking that their food came from “Uncle Sam” and calling themselves “Uncle Sam’s soldiers”. After the war, people started to associate “Uncle Sam” with anything related to the U.S. government. Uncle Sam didn’t get a standard appearance until the well-known “recruitment” image of Uncle Sam was created by James Montgomery Flagg (inspired by a British recruitment poster showing Lord Kitchener in a similar pose). It was this image more than any other that set the appearance of Uncle Sam as the elderly man with white hair and a goatee wearing a white top hat with white stars on a blue band, a blue tail coat and red and white striped trousers. The iconic Uncle Sam was shown publicly for the first time, according to some, on the cover of the magazine Leslie’s Weekly, on July 6, 1916. The figure in the long-tailed coat, stove pipe hat and sideburns was captioned “What Are You Doing for Preparedness?”. More than four million copies of this image were printed between 1917 and 1918. Flagg used a modified version of his own face for Uncle Sam. When asked to update the highly effective image for use in World War 2, Flagg hired the Indiana-born veteran Walter Botts to pose for him. According to his widow’s memoir, Walter Botts was chosen over other models for Flagg’s Army poster “because he had the longest arms, the longest nose, and the bushiest eyebrows”. Botts reportedly suggested the pointing gesture when the artist asked “Walt, what are you going to do with your long arms, sitting there?”. In 1961 the U.S. Congress acknowledged what political cartoonists had known for years, that Uncle Sam was a national symbol. Congress passed a resolution saluting “Uncle Sam Wilson of Troy, New York, as the progenitor of America’s National symbol of Uncle Sam”. (Photo credit: Jerry Heard / The Library of Congress). At last, I came face to face with Uncle Sam! !